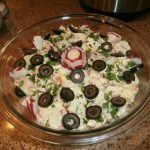 This redneck potato salad recipe is quite an change from our families' staid potato salad but it has some enhancing features, such as the crab boil and Cajun seasonings. Goes great with a down home Muffulleta sandwich!Note: You can change the number of people served by placing your cursor over "Servings". The Ingredients will adjust to the new number of servings. Clean and trim 2 pounds of red potatoes and cut into bite size cubes. Bring to a boil 8 cups of water or enough water to cover the potatoes and put in 2 tablespoons of Zatarains Crawfish, Shrimp and Crab boil. Add the potatoes and simmer until easily pricked with a knife, about 20 minutes. Drain them and pour them out on a clean cotton towel to dry. Finely chop the red onion and the red bell pepper and set aside. Place the 4 large eggs in a pot of boiling water and simmer for 12 minutes. Drain the eggs and immediately immerse them into a bowl of ice water. When cool enough to handle, peel the eggs, rinse and reserve in the refrigerator. Fry the 4 rashers of bacon till crisp, place on paper towels to drain. Set aside. In a small bowl, mix the cup and a half of mayonnaise, the 1 1/2 tablespoons of mustard, and the dill relish, taste and adjust the seasoning with salt and pepper. In a large bowl, add the potatoes, the mayonnaise dressing, the bell pepper, onion, chopped eggs, bacon and the olives. Mix all the ingredients until well blended, taste and adjust seasonings to your liking. You can add salt and pepper to taste. Sprinkle the top with chopped parsley and the teaspoon of Louisiana Cajun seasoning.